My yoga teacher likes to ask: what is more important – your hamstrings or your liver? The question is not meant to undermine the importance of the structural issues that we might have, but rather to remind us that our bodies are much more complex. As yoga teachers we often become so focused on the anatomy (muscles, joints, bones) that we forget about other important processes that make our bodies function smoothly. Sure, we don’t think much about the heart, liver or lungs while they quietly do their job; but the moment one of them starts to malfunction (in ourselves or those close to us), our whole world turns upside down. I spend the last weekend at a conference put together by the International Association of Yoga Therapists and listened to the medical professionals and yoga therapists share their research and experience working with students with heart disease, cancer, diabetes and many others. I was reminded of how much suffering is taking place around us and delighted to reaffirm that yoga practice can have a profound impact on preventing certain diseases, managing the symptoms and improving the quality of life. Through centuries, the yoga tradition has accumulated a vast body of knowledge on ways to relieve human suffering. But true knowledge does not lie in mastering difficult postures or complicated techniques. It lies in developing an insight and intimate knowledge of how our systems function and learning the tools to fine-tune them when necessary. Our systems are complex and multidimensional. The way my teacher, Gary Kraftsow, puts it: “I’ve never seen a lumbar spine come into my office without a liver attached to it. Or a liver come in without an attitude.” Therefore, if we are planning to be vibrant, healthy human beings, we need to consider all the components that make up our systems: physical structure, physiological processes, the content of our minds, our ideas and attitudes toward our surroundings and our sense of longing for connection to something greater then ourselves. 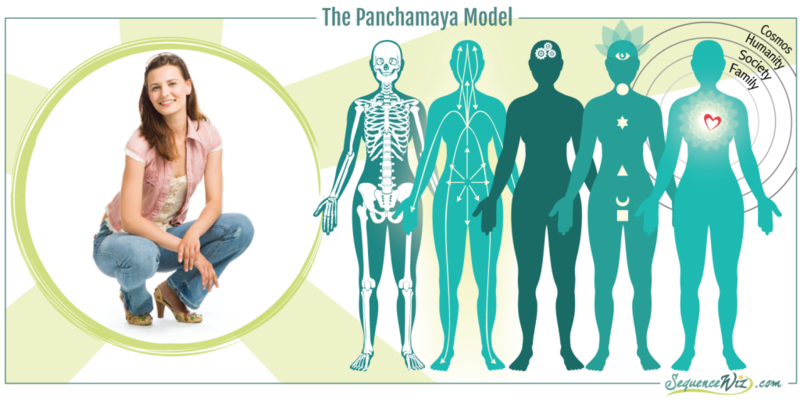 The Panchamaya model (also called 5 koshas) is a way to organize our thinking when it comes to different layers of our systems. 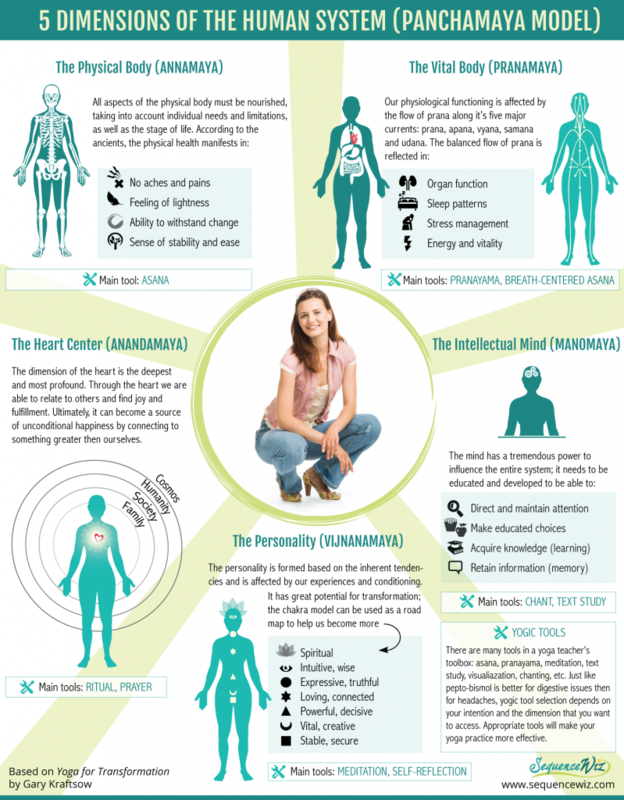 Everything you’ve ever learned about yoga fits somewhere within the panchamaya model and is meant to serve a practitioner on one level or another. I find that sometimes the 5 koshas are presented as something too “out there”, while in reality it just describes the yogic view of how things work within our bodies and minds. The panchamaya model is extremely useful (I would even say necessary) when we are trying to understand what’s happening within ourselves or our students. Here is a quick overview of the 5 dimensions of the human system and the main yogic tools (practices) that give us access to each one of those dimensions. In the next few weeks we will be shifting our focus from physical (annamaya dimension) to physiological (pranamaya dimension) and explore what we can do to fine-tune our physiology: organ function, energy, stress response and sleep. Stay tuned! Interesting. There has to be some kind of work to be made not in the physical part of the body, to “open it”. Some of us work hard stretching the body but the change never happens or it’s small. Next story Why bother with breath in yoga?